At the European parliament, it's neither Shimon Peres nor Netanyahu who get standing ovations. It's Mahmoud Abbas who is invited and gets a standing ovation. On 4 Feb 2009, PA President Mahmoud Abbas in an address to the European Parliament in Strasbourg: "You must stop cooperating with Israel as it's placing itself above the law. Their actions have no legal basis and must be ended. Israeli leaders should also be charged with infringing international humanitarian law." 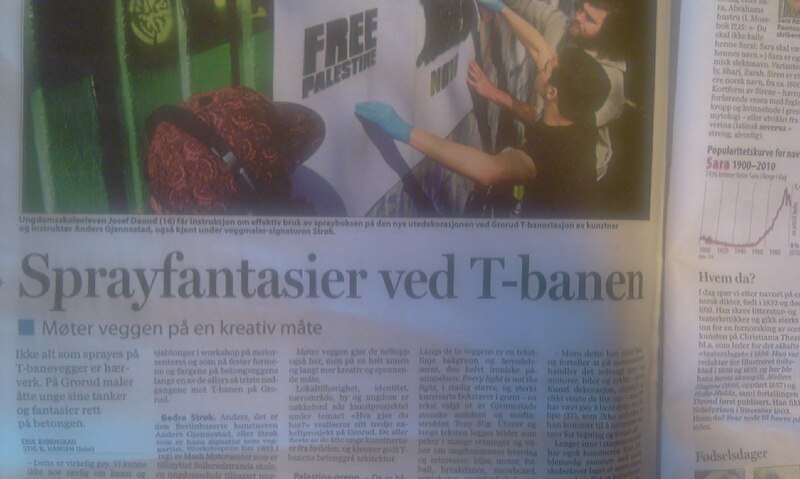 "Josef is in the process of laying a sjabon (template) of a Palestinian flag and filling it in with pearl-green spray-paint, and the text Free Palestine Now." You could not make this up. An art project is teaching young delinquents how to express themselves by spray-painting “Free Palestine” on the walls of the subway station. Hostility to Israel at the European Parliament is rife - and it does not come only from the left, it is much alive within the conservatives and the far-right (also anti-Jewish). It should come as no surprise that the flotilla and Hamas friends are not necessarily viewed with suspicion. A young Belgian citizen involved in Hasbara activites, Fabian Cohen, who has previously worked close to the Italian MEP Niccolò Rinaldi (conservative, "Italy for Values" [!] group, ALDE-group at the European parliament), wrote to him (see his letter in French here), and this is the reply he received. It is interesting that this sophisticated politician relies on Al-Jazeera and Wikipedia for "objective information". For background see this: European parliament celebrating Hamas friend Vittorio Arrigoni. I never understood the reasons for so much hostility to the Flotilla. I know many of the Italian members of the Flotilla, including quite a number of Jews, and I can assure you that they are pure non violent activists. But exactly in order to avoid any misunderstanding, in their meetings in Strasbourg the organizers have requested to the President of the European parliament and to the High representative that EU curries inspections of the cargo so to assess that only humanitarian material will be on board, and to exert adequate control over the initiative, also in order to guarantee appropriate security for the participants. On Arrigoni: I didn't agree with everything he said or did, but he was a brave man [who called Zionists "rats", it was mentioned in Fabian's letter]. In Gaza he liked to pay a tribute to the graves of Jews soldiers under the British Army who are buried there [he made sure he was filmed and posted it the film on YouTube doing this]. I never heard anything antisemitic from him and (you can find an interesting profile of him on Al-Jazeera, and several objective information on wikipedia). Although none of us is a perfect man, dialogue should always prevail, and this implies also the attempt to understand the other's point of view. BRUSSELS (EJP)---A lecture by an Israeli army senior official in Brussels was cancelled following pressure by pro-Palestinian NGOs on the organizers, EJP has learned. Colonel Liron Libman, head of the International Law Department in the Military Advocate General’s Headquarters of the Israel Defense Forces (IDF), was scheduled to speak Wednesday at the invitation of the Belgian section of the International Law Association about “the challenges in asymmetrical warfare: an Israeli experience”. But several days ago, he was told by the organizers – the Belgian section of the International Law Association - that the conference had to be cancelled for “reasons out of their control” and that an alternative date “was being sought later” for a new event, Libman told EJP in Brussels. Several Belgian NGOs had called for a boycott of the event in a letter to the chairman of the Belgian section of the International Law Association, Kim Van der Borght, a university law professor [at Westminster University (England) and Professor of International Economic Law at the Centre for Economic Law & Governance (University of Brussels VUB)]. 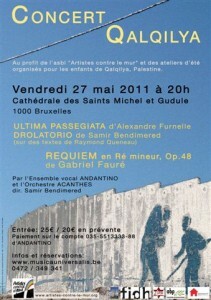 Several Belgian anti-Israel NGO are organising, with the approval of the Belgian Catholic Church, a "charity concert" to raise funds for Artists against the Wall (the association is supported by the government and its anti-Israel agenda is notorious). The concert is being given wide publicity by associations like the Brussels branch of the Anna Lindh foundation (the murdered Swedish politician known for hostility towards Israel). "In 1370, according to the legend, holy communion wafers began to bleed after being stabbed with daggers by the Jews of Brabant at the synagogue in Brussels. The remains of the hosts were venerated for centuries as the Miraculous Sacrament (Sacrement du Miracle/Sacrament van Mirakel). It is a fact that in May 1370 some six Jews living in Brussels and Leuven were burnt at the stake after being accused of the theft and desecration of the Blessed Sacrament (the so called ‘Blood Libel’). We know that Jewish property was confiscated, and that from the very beginning it was believed that the holy hosts had actually bled. Later on, in the XVIIth and XVIIIth centuries, it was asserted that in 1370 all Jews had been expelled forever from the Duchy of Brabant. The guilt of the Jews was never established. On the contrary, it has never even been proven that the hosts had in fact been desecrated. Belief in the alleged miracle was the only justification for executing the Jews. Accusing the Jews lent credibility to the miracle. Moreover, the alleged miracle offered a sought-after opportunity to dispose of the Jews. For the faithful the ‘miracle’ served as a material sign and proof of the real presence of Christ in the Eucharist. 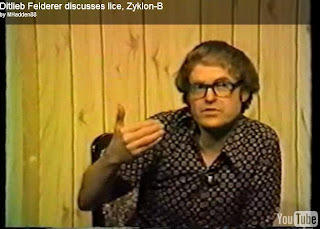 Similar ‘Eucharistic Miracles’ connected with the presumed culpability of the Jews occurred elsewhere as well during the Middle Ages. Traces of red mildew on holy wafers were taken for traces of blood, the blood of Christ. A reader wrote to draw our attention to the Facebook page of Austrian anti-Semitic, pornographer and Holocaust-denier (a bit difficult to write and to understand) Dietlieb Felderer. He has around 70 amis, and one of them is French member of the European Parliament Bruno Gollnisch (Front National). He used to be very close to the party's ex chairman Jean-Marie Le Pen and number two of the party. 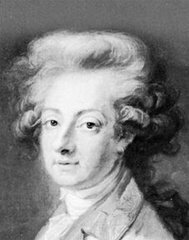 Gollnisch is a professor at the University of Lyon III . Interesting to see that these far right folks have some strange friends. / http://joy-thought.blogspot.com/ http://kim-freethoughts.blogspot.com/ http://europeanhumanrights.com/ and others. So don't be a Holocaust Denier. 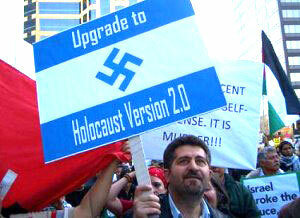 Proudly tell the world that there is nothing as vibrant as a Holocaust erection. It's the only religion all agree on and practice! WHERE CAN I FIND THE HUGE OLYMPIC SWIMMING POOL AT THE AUSCHWITZ RELIEF CAMP? Just pass the huge Kitchen, the largest building in the camp, on your right, and the Brothel on the left, and go straight up the road. It is behind Block 6. Happy swimming along with Anorexia Slim! JAZZ IN AUSCHWITZ! SIX ORCHESTRAS NOT SIX MILLION DEATH AT AUSCHWITZ! CATHOLIC RELIGIOUS MUSIC AT AUSCHWITZ! DANCE AT AUSCHWITZ! WHAT'S NEXT? "The German Foreign Ministry – as with other European foreign ministries – should more closely monitor and evaluate how its funding to various NGOs is actually utilized. Groups that receive Foreign Ministry funding should not utilize it in a manner that contradicts the official policies of the government or contradicts the NGOs’ own stated mission and principles." BERLIN – Controversy is swirling around the German NGO Medico International for its financial support of the Israel-based NGO Breaking the Silence, including its support for a planned – but subsequently canceled – book presentation on Tuesday in Ramallah. Prof. Gerald Steinberg, the president of the Jerusalem-based human rights watchdog organization, NGO Monitor, told The Jerusalem Post before the cancellation that, “This specific event in Ramallah – funded by a German NGO – highlights Breaking the Silence’s facade. The organization presents itself as a grassroots NGO, directed towards Israeli audiences, but many of its events take place outside of Israel, using funding from European governments and the New Israel Fund. Medico International, a health-services provider, was listed as a sponsor of Breaking the Silence’s book presentation, according to a posting on the website of the Association of International Development Agencies (AIDA). Six million Jews, of which 1.5 million were children, were exterminated by the Nazis and their willing executioners, but six decades later Europeans demonstrate a "disturbing lack of knowledge about the Holocaust". It must be pointed out that although Sweden is large part of this campaign as a major international donor, it is not alone. There is a linkage with other countries through Christian Aid and its activist recruiting partner Ecumenical Accompaniment Program in Palestine and Israel (EAPPI). These international organizations work to delegitimize Israel through fund-raising and propaganda. In the UK most churches (with the notable exception of pro-Israel evangelical Christians) support Christian Aid and its agenda. The Simon Wiesenthal Center, whose representative recently visited Malmö in an attempt to promote tolerance, published a blog post which takes the UK Methodists—probably the most radical of major UK churches—to task for an article published on the official Methodist website by a church official. The main point of the article, which purports to give Jewish and Muslim perspectives on Israel and Palestine, is that Jews use Holocaust education to justify Israel’s existence. It also complains that non-European Jewish students are being indoctrinated about an event which had nothing to do with them. Labels: Christian hostility against Israel, Sweden, U.K.
Hanne Nabintu Herland is the kind of Norwegian intellectual who stands out from the crowd. In the piece below she states that Norway is the most anti-Semitic country in the west and explains how the state of affairs sometimes makes her ashamed to be Norwegian. She is Norwegian academic, historian of religions and bestselling author. The President of Israel, Mr. Shimon Peres’ critical comments on Norway's reluctancy to follow EU, UN and USA in denouncing Hamas as a terrorist movement, are timely remarks. If one adds Harvard professor Alan M. Dershowitz article in the Wall Street Journal (30 March), it all makes me ashamed to be Norwegian. 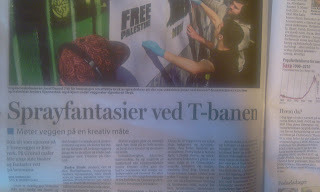 Under the title Jews are not welcome in Norway. Mr. Dershowitz told of his encounters with anti-Semitic Norwegian academics who made it clear that he was unwanted as a guest lecturer at Norwegian universities. This is how Norwegian intellectuals treat one the West’s most famous defense lawyers and an internationally renowned Harvard University professor. I met Dershowitz in March during Oslo Symposium 2011. His description of the obvious anti-semitism and the lack of willingness to be objective that characterizes Norwegian academia, is flat out shocking. During my opening lecture at the same Symposium Conference, I pointed out that the lack of nuances that characterizes the Norwegian understanding of the realities in Israel and the Middle East are not only shameless, but historically inacurate. For culturally we have much more in common with the Jewish people than one would think. Western civilizational values ​​has its cradle in the Greek and Roman contributions, but also, and especially when it comes to values, in the Hebrew-Christian contribution. The European humanistic view of the dignity of human beings regardless of rank, class or ethnicity carries deep impact from Judaism. These values are at the core of what it means to belong to Western Civilization today. Pages 4 and 5 of the daily De Morgen of today carry the results of a survey among young Muslims in Brussels high schools. 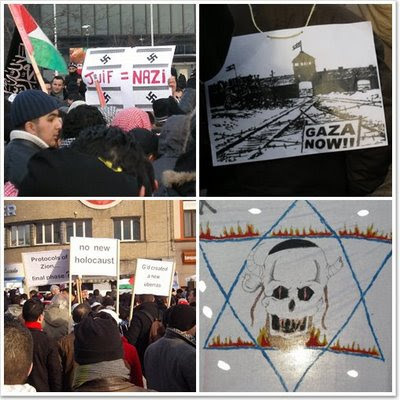 It finds that half "can be described as anti-Semitic which is a very high rate", says VUB sociologist Mark Elchardus. The corresponding rate for Dutch-speaking Flanders is 10 percent. "Worse, [in Brussels] anti-Jewish sentiments are unrelated to the level of education or poor social living conditions," says Elchardus. "Anti-semitism is theologically inspired. There is a direct link between being Muslim and anti-Semitic feelings. Catholics, too, are negative toward Jews too, but their sentiments are by far not as strong." "Defending the Arabness of Palestine alongside the plight of struggle with its people towards the liberation of Palestine from the river to the sea [i.e. total annihilation]. Hence, the Zionist entity ‘Israel’ remains a colonial settler base with no right to exist on any fraction of Arab soil. Furthermore we consider armed struggle and martyrdom as the unique strategy for liberating Palestine." "European states do not agree on much. But the EU, as manipulated by unelected bureaucrats in Brussels, does agree on at least a few things, “peace,” oil, and eliminating pesky problems, especially the Arab-Israeli conflict. There is little domestic price to be paid for anti-Israel policies in European nations and none at all at the EU level. Quite the contrary, the conceit of “peace,” to be realized almost exclusively through Israeli concessions, is an unquestioned ideology. Like the UN, EU foreign policy directorates are staffed with internationalist true believers who are paid to moralize and not consider the interests of member states, much less those of Israel. European states may be broke and the union in disarray about virtually everything, but pressure on Israel and the “peace process” is a convenient source of reconciliation." European relations with Israel are in flux after the signing of the Palestinian reconciliation deal. Prime Minister Benjamin Netanyahu has been meeting European counterparts to shore up support for a series of red lines regarding negotiations with a new Palestinian government, namely the recognition of Israel and renunciation of violence. This has met with predictably limited success. 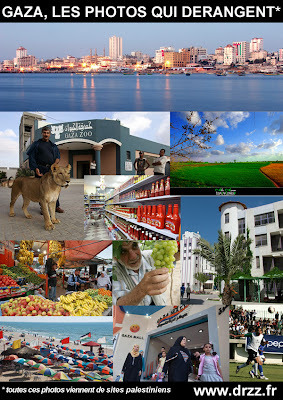 A certain amount of bilateral duplicity is expected in Israeli relations with European countries. British Prime Minister David Cameron met with Netanyahu and then called on Hamas to reject violence, recognize Israel’s right to exist, and to join in negotiations. But this was immediately undercut by an “unnamed senior diplomatic source” who threatened that Britain would recognize a unilaterally declared Hamas-Fatah state if Israel did not make “substantive progress” – meaning major concessions – to the same Palestinian Authority that has refused to negotiate for more than a year. Netanyahu claimed to have secured similar assurances from French President Nicholas Sarkozy, and similar threats were made by Foreign Ministry sources about French recognition of a Palestinian unilateral declaration of independence. Both Cameron and Sarkozy need to pander to substantial Muslim electorates, as well as to non-Muslim voters who are, in the uniquely European fashion, dedicated to pacifism at all cost, particularly Israel’s. But there is another level altogether that should be addressed, the European Union and its foreign policy, as embodied by Catherine Ashton. European foreign policy is a vast new institution. The “European External Action Service” is the diplomatic corps and foreign ministry of the EU, directed by former British Labor Party apparatchik Catherine Ashton. It has a proposed budget of almost $8.3 billion and will have a staff of 7,000 spread out in 137 missions around the world. European Union foreign policy is a mechanism in search of a problem. Labels: European Union, France, U.K.
Spanish journalist uses Yom HaShoah to criticize Israel. 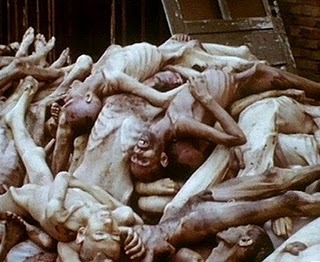 "Yesterday night, during a ceremony held at the Yad Vashem, the Holocaust Museum in Jerusalem, prime minister Binyamin Netanyahu told that the world hasn't learnt the lesson derived from the Holocaust, and compared the Holocaust, that is the Second World War nazi actions against Europe's Jews with the current Iranian threat. It's something which seems to be disproportionate and out of place but all Israeli leaders talk endlessly about Iran, once they see a microphone within their reach, and Netanyahu is not an exception, although Iran is a country which never has attacked anybody, unlike Israel, and in exchange it had to endure aggressions." So Eugenio García Gascón pretends to make his readers to believe that Iran never attacked anybody while Israel did, and that Iran suffered attacks. The truth is that Iran attacked others in the past and is currently doing so. 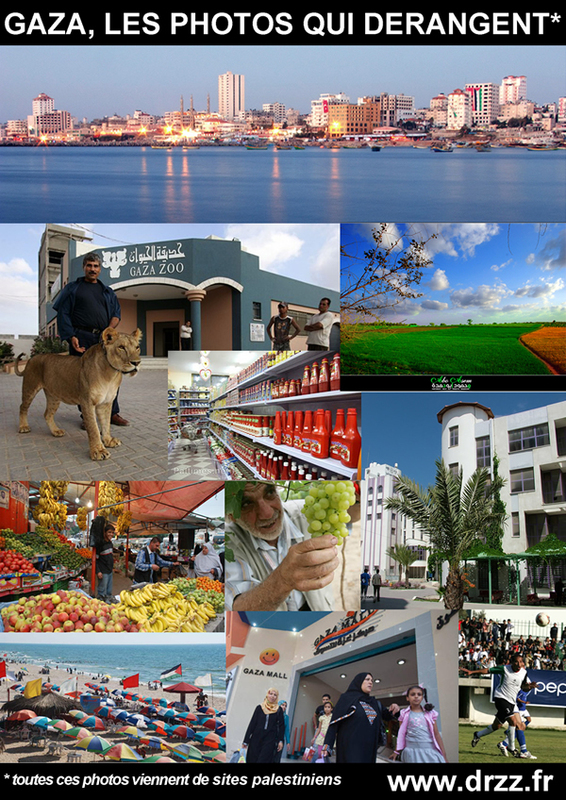 Its victims include Iranians (real or alleged political dissidents, homosexuals, adulterous and raped women, and so on), Israelis (who suffer attacks by terrorists organizations supplied with weapons by Iran), Palestinians (who suffer repression by the aforementioned organizations) and the Red Crescent (whose ambulances were used by the Iranian Revolutionary Guard to smuggle weapons into Lebanon). Meanwhile, aggressions against Israel are not mentioned by Eugenio García Gascón as the main cause of Israel's defense policies. It's not also told by the Spanish journalist how, while Iran was being attacked by Saddam Hussein-led Iraq between 1980 and 1988, the Persian State received Israel's help; in spite of this, Iran refused to re-establish ties with Israel. 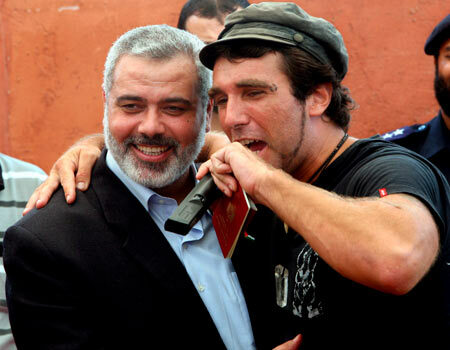 Vittorio Arrigoni was the Italian "pacifist" who was murdered by his Palestinian friends in the Gaza strip. He loved Hamas and hated Zionists (or Jews?) and called them "rats". 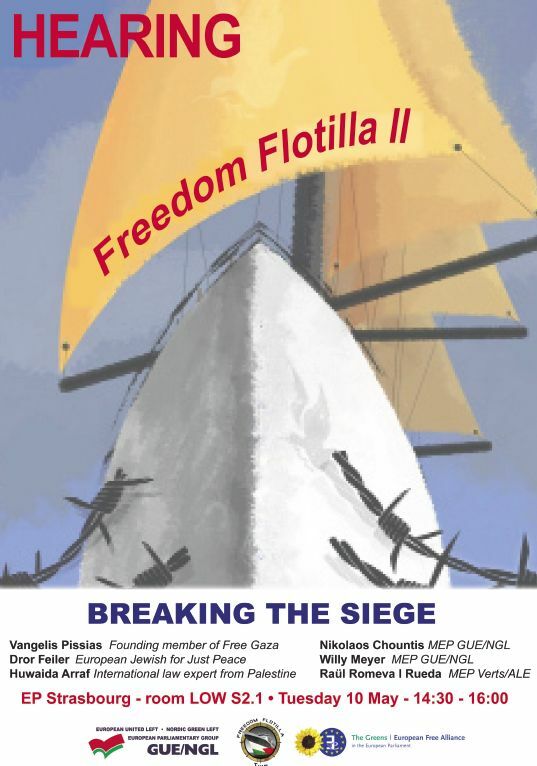 Now the European parliament is celebrating the man and the "peace" flotillas. No wonder Europeans are discontented with the EU. See: The murder of a European 'pacifist' who hated Israel. The Free Gaza movement is a human rights group that, since August 2008, has travelled nine times to Gaza by sea to break Israel's illegal stranglehold on the 1.5 million Palestinians that live there. On 31 May 2010, in a lethal attack against the Freedom Flotilla, nine people were killed and many more injured by Israeli commandos. 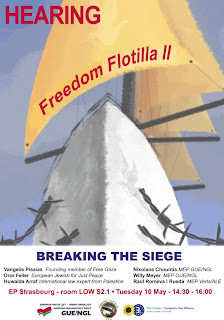 The FREEDOM FLOTILLA – STAY HUMAN is the next flotilla of boats that will be sail to Gaza to break the siege.